Jenni Sparks is an urban storyteller with an eye for the offbeat, fantastic and slightly eccentric experience. Her fresh approach to visual maps – hand drawn and custom tailored – make the past come alive while embracing new discoveries. 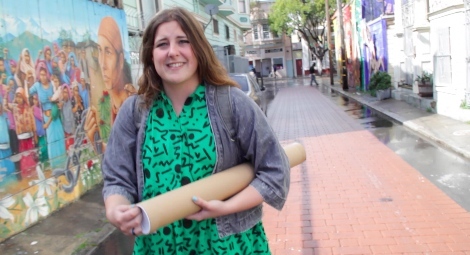 The young artist from England has completed extraordinary maps that include layers of history, fun facts and celebrity mentions of London, Berlin and New York – and now her latest upcoming project is San Francisco. What’s fascinating is how quickly Jenni catches on to the social landscape, stereotypes and the beat of the community. I caught up with the creative when she visited San Francisco in April to absorb the city and meet with artists, bloggers and designers. “It’s about the locals who really care about the city, and that’s something I want to put across,” she said. We took a walk through the Precita Murals area in the Mission where she studied the social metaphors displayed down back streets and alleyways. It’s certainly a brilliant time to document San Francisco as it goes through a wave of growth bathed in controversy over the explosive wealth gap. I thought of this vintage cartoon map from 1927 and how Jenni’s creation will be a time capsule in itself. Jenni Sparks has been featured on Buzzfeed, Cool Hunting, The Guardian and the Mail. She’s released some preview shots of her San Francisco map through Instagram. Her meticulously prepared piece is expected to be released soon. July 24, 2014 in Video Postcards of San Francisco.